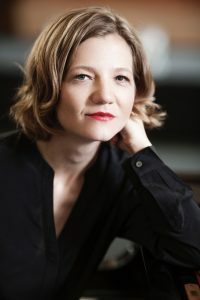 Lithuanian pianist Ieva Jokubaviciute’s critics describe her intricately crafted performances as possessing ‘razor-sharp intelligence and wit’ (The Washington Post). In addition, other critics describe her as ‘an artist of commanding technique, refined temperament and persuasive insight’ (The New York Times). In 2006, she was honored as a recipient of a Borletti-Buitoni Trust Fellowship. Ieva’s debut recording (Labor Records) released in 2010, received international acclaim resulting in recitals in New York, Chicago, Philadelphia, Baltimore, Washington, Vilnius, and Toulouse. She released Returning Paths: solo piano works by Janacek and Suk in 2014. She has performed concerti with the Chicago Symphony Orchestra, the American Youth Philharmonic, and with orchestras in Rio de Janeiro, Brazil and in Montevideo, Uruguay. Her piano trio—Trio Cavatina—won the 2009 Naumburg International Chamber Music Competition and toured nationally from 2005-2015. In the fall of 2016, Ieva began a collaboration with the violinist Midori, with recitals in Columbia, Peru, Mexico, Japan, Canada, and throughout Europe. A much sought after chamber musician, Ieva’s collaborative endeavors brought her to major stages around the world, such as: Carnegie Hall’s Stern Auditorium, London’s Wigmore Hall, and Washington DC’s Kennedy Center. She regularly appears at international music festivals including: Marlboro, Ravinia, Bard, Caramoor, Chesapeake Chamber Music, Kneisel Hall, Four Seasons, and Prussia Cove in England. Earning degrees from the Curtis Institute of Music and from Mannes College of Music, her principal teachers included Seymour Lipkin and Richard Goode. In the fall of 2015, Ieva began her tenure as Assistant Professor, Piano at Shenandoah Conservatory in Winchester, VA.